Do you like this property? A newly built four bedroom house with garage. The large sitting room is enhanced by a large bay window adding both extra dimension and light. 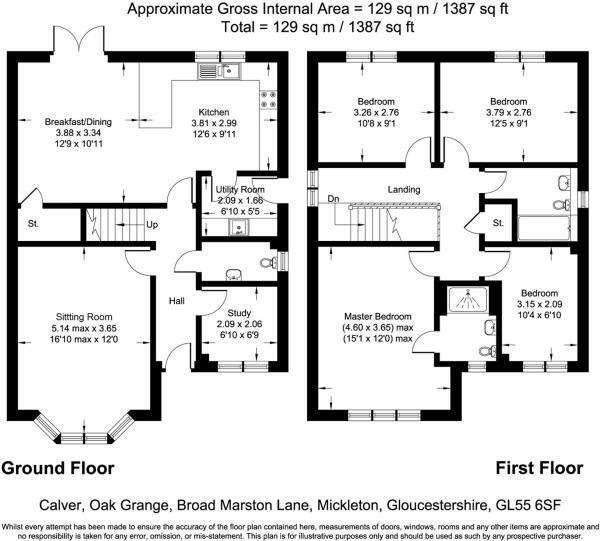 In addition on the ground floor there is a study, cloakroom and utility room. A feature of this property is the fitted kitchen off which lies the spacious breakfast/dining area which has French doors leading to the garden. On the first floor there is a generous master bedroom with en-suite bath/shower room with an additional 3 bedrooms and family bath/shower room. To the rear lies an enclosed garden with adjacent single garage and parking. How much will it cost me to call the number displayed on the site? Standard geographic charges from landlines and mobiles apply and calls may be included in your telecom provider's call package. There are no nearby secondary schools found. 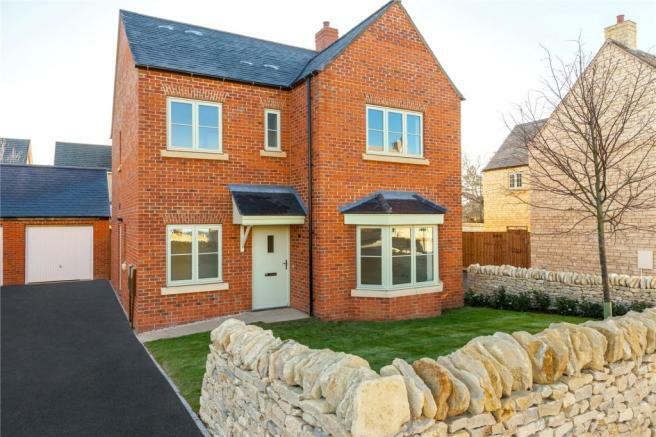 Due to the frequency with which Inspection bodies, such as Ofsted, provide us with updates, there could be a delay of up to 8 weeks between a rating being updated and it being displayed on Rightmove. This data is provided for informational purposes only and Rightmove plc does not accept any liability for decisions based on this data. The data is sourced from Experian and contains public sector information licensed under the Open Government Licence v3.0. Experian does not accept responsibility for any inference or conclusion derived from the data by third parties. © Crown copyright material is reproduced with the permission of Land Registry under delegated authority from the Controller of HMSO. © Crown copyright material originating from the Registers of Scotland is reproduced with the permission of the Registers of Scotland. If you have found an error with the data relating to a transaction in England or Wales, please contact Her Majesty's Land Registry (HMLR). If you have found an error with the data relating to a transaction in Scotland, please contact the Registers of Scotland. Permitted Use: Viewers of this Information are granted permission to access this Crown copyright material and to download it onto electronic, magnetic, optical or similar storage media provided that such activities are for private research, study or in-house use only. Any other use of the material requires the formal written permission of Land Registry which can be requested from us, and is subject to an additional licence and associated charge. Please note the dates shown relate to the property's registered date not sold date. Disclaimer - Rightmove.co.uk provides this Registers of Scotland data "as is". The burden for fitness of the data relies completely with the user and is provided for informational purposes only. No warranty, express or implied, is given relating to the accuracy of content of the Registers of Scotland data and Rightmove plc does not accept any liability for error or omission. How can I use the information? The Registers of Scotland allows the reproduction of the data which it provides to Rightmove.co.uk free of charge in any format or medium only for research, private study or for internal circulation within an organisation. This is subject to it being reproduced accurately and not used in a misleading context. The material must be acknowledged as Crown Copyright. You are not allowed to use this information for commercial purposes, nor must you copy, distribute, sell or publish the data in any way. For any other use of this material, please apply to the Registers of Scotland for a licence. You can do this online at www.ros.gov.uk, by email at data@ros.gov.uk or by writing to Business Development, Registers of Scotland, Meadowbank House, 153 London Road, Edinburgh EH8 7AU. Disclaimer - Property reference CHC170144. The information displayed about this property comprises a property advertisement. Rightmove.co.uk makes no warranty as to the accuracy or completeness of the advertisement or any linked or associated information, and Rightmove has no control over the content. This property advertisement does not constitute property particulars. The information is provided and maintained by Jackson-Stops, Chipping Campden. Please contact the selling agent or developer directly to obtain any information which may be available under the terms of The Energy Performance of Buildings (Certificates and Inspections) (England and Wales) Regulations 2007 or the Home Report if in relation to a residential property in Scotland. * Average speeds are based on the download speeds of at least 50% of customers at peak time (8pm to 10pm) from packages available on comparethemarket.com. Speed can be affected by a range of technical and environmental factors. The speed you receive where you live may be lower than that listed above. You can check the estimated speed to your property prior to purchasing. Fibre/cable services at your postcode are subject to availability. You can confirm availability on the provider's website. Providers may increase charges. You should have the right to exit your contract without penalty if this happens. The information is provided and maintained by Decision Technologies Limited. Ensure you're up to date with our latest advice on how to avoid fraud or scams when looking for property online. In order for us to help our agents maintain accurate and up-to-date information please inform the agent if you have noticed an error with this property. If you are the vendor, please contact your agent directly.